I had to make an emergency trip to Goa and it’s been 2 days now with a 13.5 hrs time difference. Fighting the jet lag after a 20 hour flight and trying to enjoy my mum’s home cooked food. I am hoping to get some pictures that I can post when I get back from my short trip. Wishing you all a great Thanksgiving week and be safe while you travel. This recipe of Baked Turkey with Cafreal Spices for Thanksgiving has a nice spice kick to an all time classic recipe. I had to try this recipe as my husband is not a great fan of turkey but he seemed excited about this one. He loves spicy foods. Turkey in Goa is made mostly for weddings, its was considered as an auspicious meat. My parents being fond of turkey always looked forward to weddings that had it on the menu. It’s amazing how your world is defined by your surrounding until I got exposed to the bigger world and so when I came to the US, I was surprised by how easily turkey meat was available. Wash the turkey, clean the inside of the cavity, wipe the turkey dry. 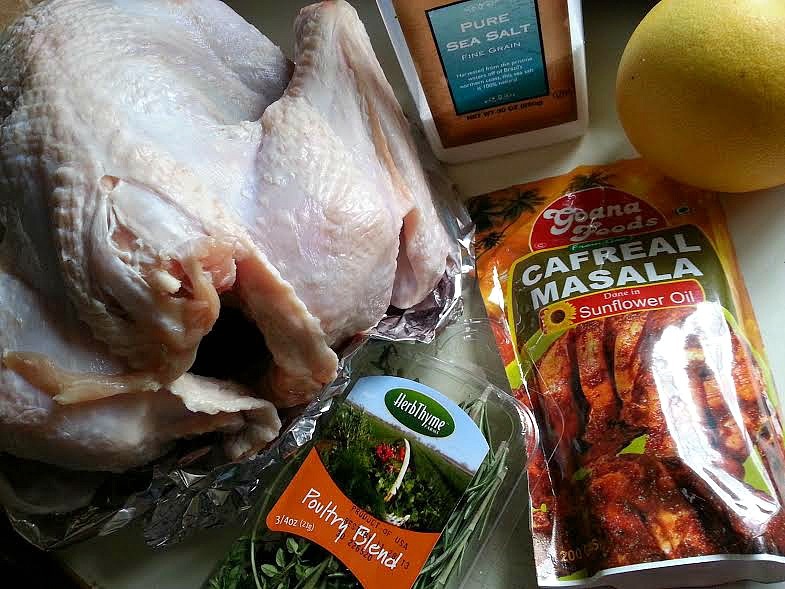 Apply salt, lemon juice and cafreal masala to the turkey, if possible apply some underneath the skin of the breast. Marinate overnight. If you like it spicy then you can add about 2-3 tbsp of cafreal masala. Drizzle the turkey with olive oil and rub it over. You can add the poultry blend inside the cavity of the turkey. Put in the turkey for 1 hr 50 minutes using the chart, that for every pound add 15 minutes to the cooking time but it depends on the oven and mine got ready in a shorter time. After 1 1/2 hrs, brush some butter on top of the turkey to crisp the skin. Check with a meat thermometer till internal temp is about 165F. Let the turkey rest for 20 minutes covered in foil, a tip I got from Ina Garten before you carve it. You can use the spiced leftover turkey for fajita or enchiladas or the all time favorite turkey sandwich. Next Next post: Tisreo Xec Xec – Clams in Curried Grated Coconut. I may have to try this on christmas day! Can not get cafreal massala where I live. What spices can I mix to get a similar taste? That turkey looks delicious! I’m sure the world loves your recipes. Hmmm, never thought about a turkey seasoned that way. Thanks for sharing. Many thanks for stopping by my blog again. I appreciate it. What a brilliant take on it! 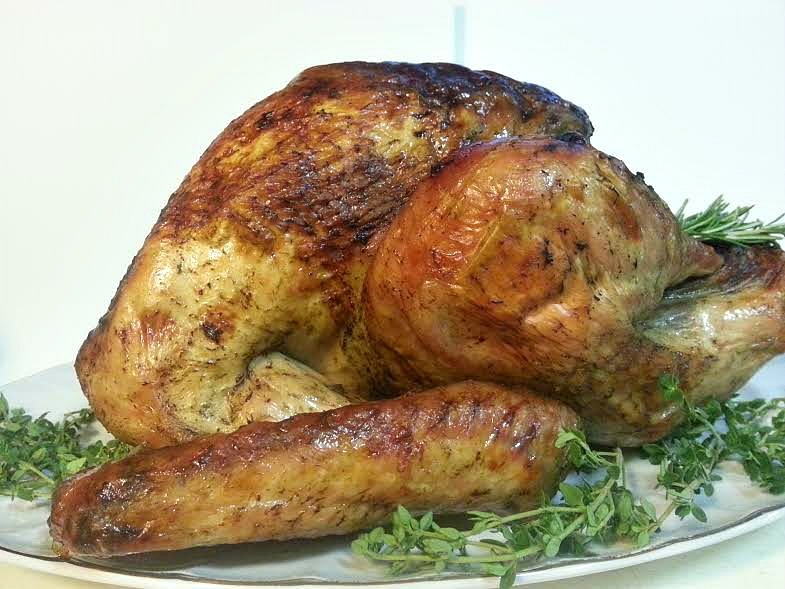 A timely recipe for Turkey with the wonderful spices that infuse it from Goa. Duane, thank you so much for your kinds words. It makes me happy to know you enjoy my blog. Dont worry I too type with one finger as well, you will get there soon just keep at it. Cafreal Masala is an Indian curry paste only available in the state of Goa. It’s made with freshh cilantro, green chili, ginger, garlic and dried spices that has been ground in vinegar. It’s available online at http://www.goanimports.com. Hope this helps. I’m so excited to try this recipe. We’re going to a Thanksgiving potluck where I’m going to bring a side dish, but we want to make our own turkey to have left overs at home :-). This looks like a perfect recipe to mix things up. Thanks and I hope you have some good family time despite the bittersweet trip home. You are welcome Bob and a Happy Thanksgiving to you as well. does the Cafreal Masala have a thick consistency like a paste? This sounds like a wonderful pesto or spread for bread, or possibly to stir into rice. It is a wet paste, but you can not eat it in it’s raw form. Cooking rice with it you can. Like Arroz con Pollo. That Turkey looks DELICIOUS Nandini! My mouth is watering and I am not even a huge turkey fan. Thank you so much Dilip. You too have a great Thanksgiving. Aw, you are in my thoughts Nandini! delicious and yummy – preparing and writing recipe in difficult and even harder to cook it. Bravo! Thank You Mihran for youur kind words. Writing recipes is very hard and you did an excellent job!! I agree I can smell that turkey roasting! Love the smell of roasting,just gives you a warm cozy feeling :-). Did I just get rhyming…hahaha! Awww…Thank You Carol you are so sweet :-). Baking Turkey can be tricky sometimes, as there is only a 50% chance of it turning out right. That was the plan… :-). Love this idea. I find turkey pretty boring, but this sounds exciting!